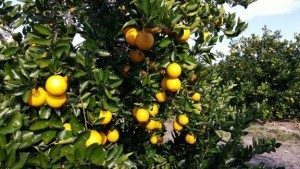 The final citrus crop forecast of the 2015-16 season, issued by Mark Hudson of the U.S. Department of Agriculture’s Agricultural Statistics Board, is up 100,000 boxes, now at 81.5 million boxes. The total comprises 36.1 million boxes of non-Valencia oranges (early, mid-season, Navel and Temple varieties), unchanged from last month, and 45.4 million boxes of Valencia oranges, up 100,000 boxes from last month. The forecast for all Florida grapefruit production is unchanged at 10.85 million boxes. Of the total grapefruit forecast, 2.5 million boxes are white and 8.35 million boxes are the red varieties. The Florida all-tangerine forecast remains at 1.43 million boxes. The total comprises the early varieties (Fallglo and Sunburst) at 800,000 boxes and the later maturing Honey tangerines at 630,000 boxes. The forecast for all Florida tangelo production is unchanged at 390,000 boxes. The Florida Department of Citrus reports the final FCOJ per box yields at 42° Brix are: all oranges at 1.405527 gallons, late (Valencia) portion at 1.472983 gallons and non-Valencia oranges at 1.347046 gallons. Producers, MARK YOUR CALENDARS. The initial crop forecast for the 2016-17 season will be issued on Wednesday, October 12th, 2016, at 12:00 noon Eastern time. THANK YOU to our LIVE Citrus Crop Forecast Coverage Sponsors!